I found this wee crocus glowing, lit up by the sunshine, when I was doing one of my many tours of the garden. Crocus scardicus is the last to flower for us so now we are in for a few months without a crocus. It will be towards the end of July when the first of the early flowering species, Crocus scharojanii, produces its first flowers. However there is so much coming into bloom just now it is hard to keep up with it all. I have taken over 400 photographs in the last three days alone as the temperature, which is reaching up to 18C, warms up the ground and brings the fastest spring flush we have had for a number of years. In recent years the Erythronium dens canis have been over before the American erythroniums came into flower but this year we are enjoying them all together as this group of Erythronium dens canis is just at its peak. The white flower is a very welcome self sown seedling from these pink forms; I love the pinks but nothing sets them off better than a few white forms intermixed in the plantings. 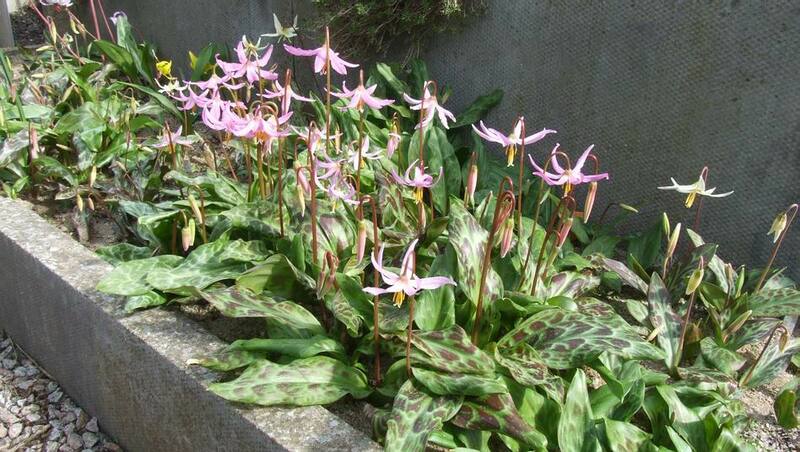 Here is a good group of Erythronium revolutum under the large Rhododendrons at the south end of the garden which is well shaded by trees and a wall. The eagle eyed will have noticed already the seed pods from last year still there and this is part of my program of naturalising the erythroniums in this bed. I was always so impressed in my early gardening years when I visited a garden where bulbs were self sowing all over the place and I always wondered why that never happened in our garden. The answer was simple we only had a few of each plant and I collected all the seed to sow in pots or send to the exchanges. Now we have built up good colonies of erythroniums and have plenty seed most years so we can allow most of them to self sow back into the beds. Now we have the complete progression from newly emerging grass-like first year leaves, often with the seed capsule attached to the top, through to seedlings flowering in situ. I do sometimes help the spread along this long bed by scattering some of the seed further than it would if left to its own devices. 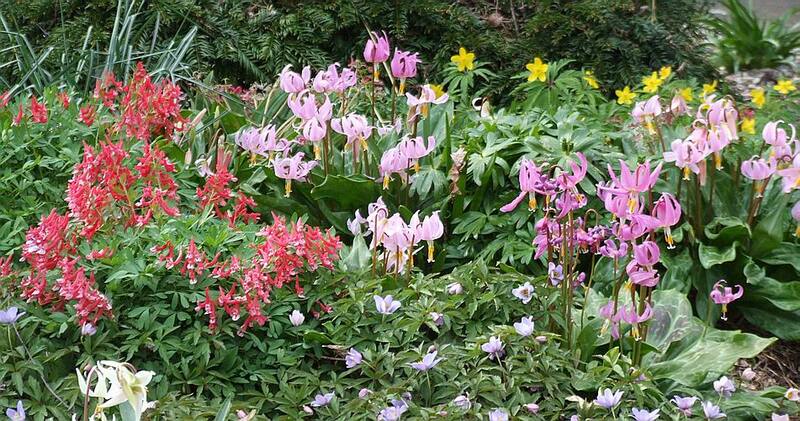 I am happy to allow self seeding in most beds as it will ensure the continuation of this joyous spring display where Corydalis 'George Baker' and Erythronium revolutum harmonise so well. Where self seeding is not so desirable is in the frames where I have a lot of different species growing in pots and baskets plunged into sand. 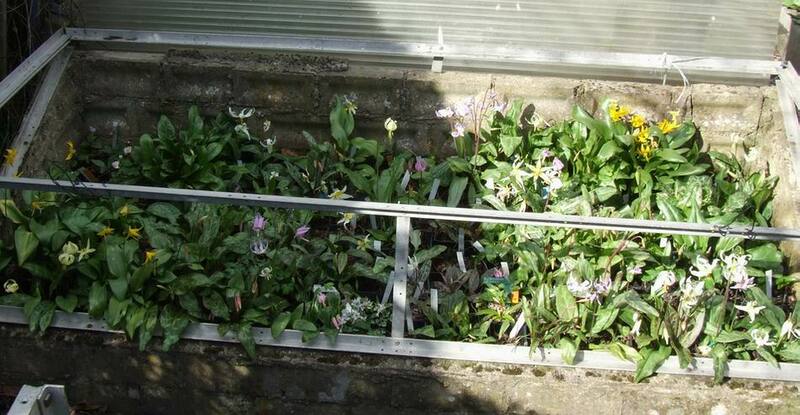 It would be fine if the seedlings of a species always fell into their own pot or basket but that is rarely the case and it is inevitable that they will end up in with another species which can lead to a great mix up of species. For this reason I try to collect the seed from these frames and when I am repotting them I separate out any very small and obvious seedling bulbs to minimise the mix up. 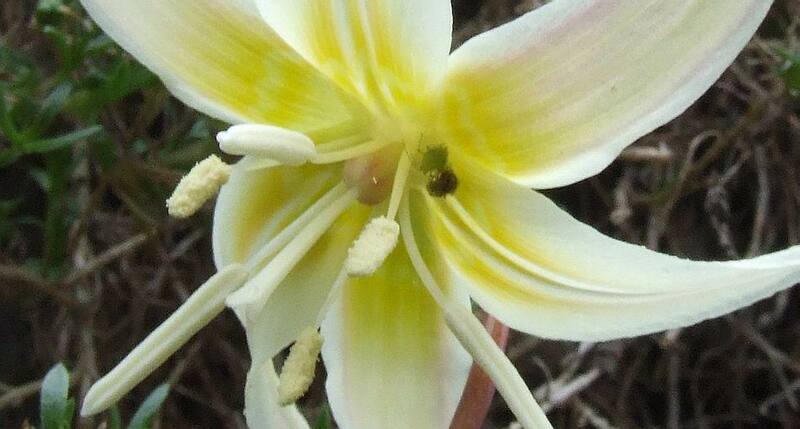 When taking some detailed photographs of the flowers I noticed the odd aphid which I wiped out. I was just about to wipe this one out until I realised what was going on here - the wee dark insect is a tiny spider doing my work for me and enjoying a tasty meal of an aphid. When you think of it that is a heck of a meal as the aphid is about the same size as the spider. 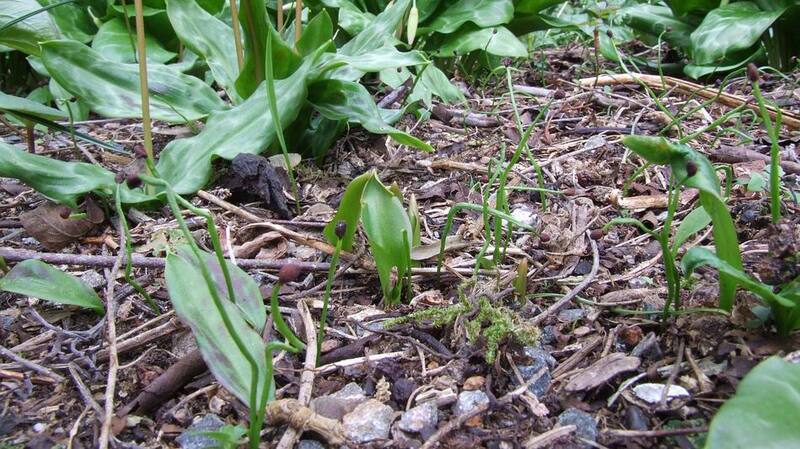 The flowers of Erythronium howellii and citrinum are almost identical except that Erythronium howellii does not have the swollen appendages at the base of the petals and E. citrinum does. 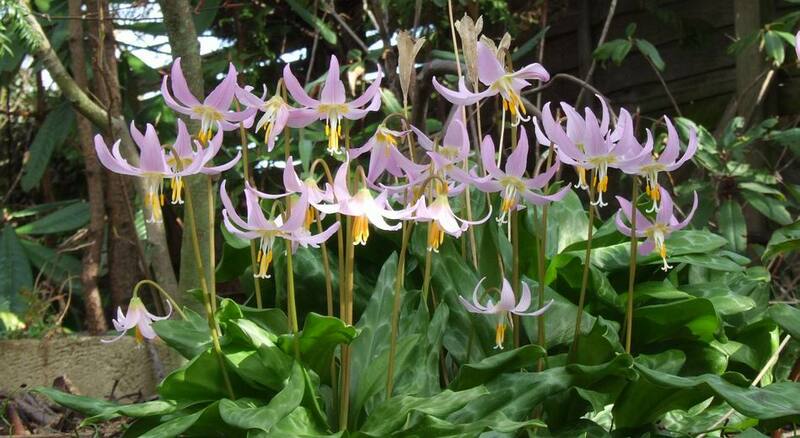 My favourite Erythronium citrinum is the fairly recently named sub species roderickii named for the late Wayne Roderick who did so much to bring the flowering bulbs of California to our attention. Another frame is bursting full of erythroniums; this time full of square plastic pots all of which will have to be repotted in July - watch this space. The flowers of the stunningly beautiful Erythronium japonicum are also enjoying the warm sunshine and I am hopeful of another good seed set this year. The seeds I harvested last year have germinated well as you can see from the inset picture at the top right and I look forward to having many more forms of this fantastic colour combination. 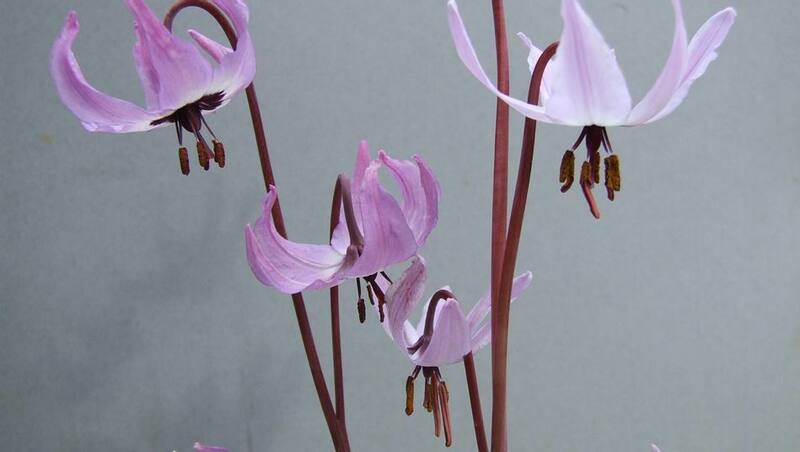 The Western North American erythroniums are not without great beauty and there we can find a similar colour combination in Erythronium hendersonii. Not quite so striking as the large single flowers of japonicum because they are smaller but you get more on a stem which makes up for that. As I am still increasing my collection of Erythronium hendersonii I sow all the seed I can harvest every year and not surprisingly when you have seen how closely I grow the plants I am finding some hybrids. 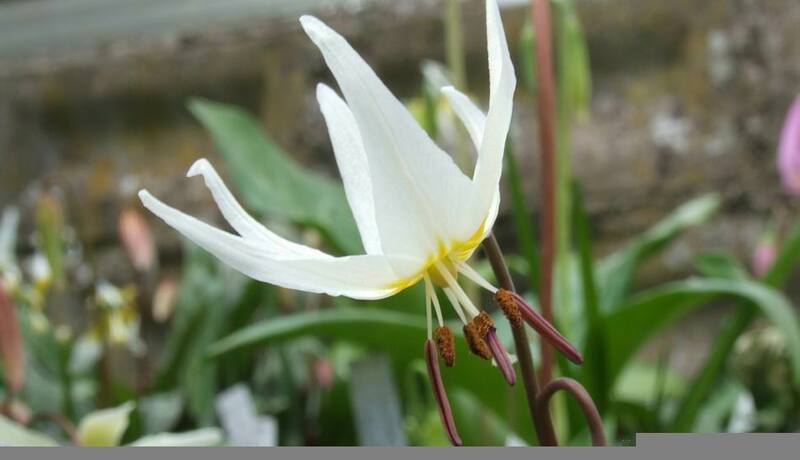 Take Erythronium hendersonii, add some pollen from E. californicum and you get an intermediate hybrid which, while not an improvement on the beauty of the parents, I hope will increase well like many of the other hybrids we have and so make a good garden plant. 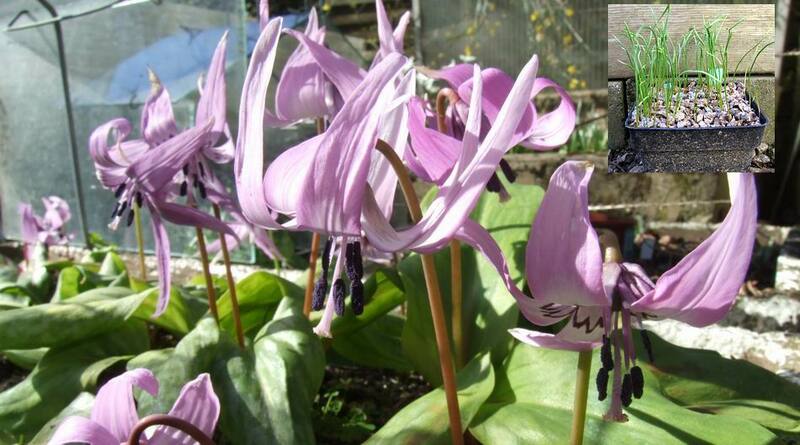 Another two hybrids involving Erythronium hendersonii, one very similar to the above while the second one on the right has inherited the dark pollen and style from hendersonii. While it has only four petals this is its first ever flower and I suspect it will have the full complement of six petals when the bulb is a bit bigger next year. 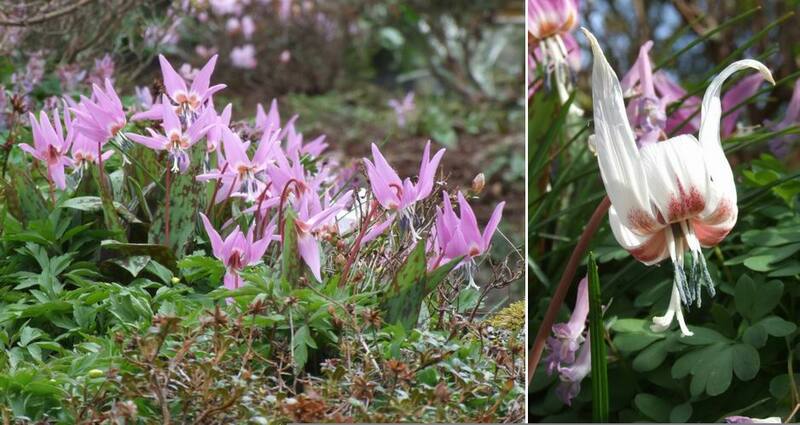 I will leave you with a selection showing some of the variation found in the flowers of Erythronium hendersonii.